Do you or any one you know in your family or friends love to cook? Do you thrive on all of those cooking shows? Do you practice the recipes that you see on TV? Well, if any of the above questions apply to you then you are going to love thiscook off. The Great American Seafood Cook-Off website is where you want to be. By logging onto this site you can pick your favorite recipe and vote for it and enter for your chance to win a trip to Louisiana to be part of the cook-off and watch your favorite recipe come to life and hopefully win. 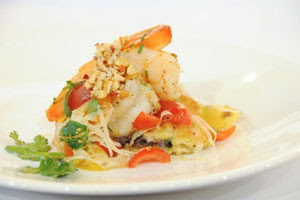 My favorite recipe from The Great American Seafood Cook-Off website is by Chef Mark Holley of Texas. His recipe is Texas Gulf Shrimp over hominy cakes with heirloom tomato relish drizzled with prickly pear gastrique. Oh, that sounds delicious. I like shrimp and tomatoes. I like to cook sometimes and see the food come to life and the look on people’s faces when it is done correctly and watch ask for more because it is so good. Another, way to make a scrumptious sea food dish is to use local fresh sea food. I have had same day catch in the Philippines and it is good. It does not have that fish taste and smell. It is just delicious. So, if you love to cook and love to watch professional chefs cook that amazing delicious food then I would highly recommend visiting The Great American Seafood Cook-Off website and enter for your chance to attend the contest. Who knows the recipe you have chosen might just be the best and you can be a part of it.